Good connection with city center. The bus station is right behind the hotel. The bus will leave you at the central train station in Florence. The bus travels frequently until late at night. The bus tickets can be purchased at the hotel. Great and helpful staff. Everything!!! Especially Staffs are all helpful and friendly. We've ask her to book a table for the famous restuarant in the city and she give us a very excellence service with her smile all the time. The location is good, you can catch a bus to the city easily because the bus stop is next to the hotel and you can but bus ticket from receptionist. Breakfast is also good. There are plenty of paking space and very safety. Great value in money for stay in Florence. The room is big and clean. The staffs are superb!! Especially Jeff, he was really helpful and awesome! Reception was fantastic. Very comfortable stay, close to Florence core. When we found out public transport is like a shuttle service to central. WIFI was 100MB connectivity as advertised on their brochures. Price is right for the off-season, and this hotel is good for travelers with BASIC needs. I'm sure they give group discounts as a lot of student travelers stay here during our trip - buses lined up at 8am to haul them off to another place. TIP - walk out the back emergency door to get to the BUS waiting outside the side road where it terminates - takes 20 minutes to get to train terminal. Buy bus tickets using credit card/cash in advance at the train station. Tickets are valid for 90 minutes and cost €1,20 each. Reception can sell you tickets for cash. Cafe Batik across the street with coffee and croissant deals. B&B Hotel Firenze Novoli This rating is a reflection of how the property compares to the industry standard when it comes to price, facilities and services available. It's based on a self-evaluation by the property. Use this rating to help choose your stay! B&B Hotel Firenze Novoli offers free WiFi throughout. Public bus number 22 to Florence historic center stops outside the building. This stylish building features modern, functional rooms with air conditioning, and a 26" flat-screen TV with free Sky channels. Each room has a private bathroom with hairdryer. Sweet and savory breakfast is served in the bright dining hall of the Firenze Novoli. Vending machines with packed food and hot and cold drinks are available at the reception area with TV lounge. Florence Airport is 0.6 mi away. When would you like to stay at B&B Hotel Firenze Novoli? Featuring free Wi-Fi, this en suite room comes with air conditioning and a 26" LCD TV with free Sky satellite channels. Featuring free Wi-Fi, this room with a private bathroom comes equipped with air conditioning and a 26-inch LCD TV with free Sky satellite channels. House Rules B&B Hotel Firenze Novoli takes special requests – add in the next step! ATM card B&amp;B Hotel Firenze Novoli accepts these cards and reserves the right to temporarily hold an amount prior to arrival. 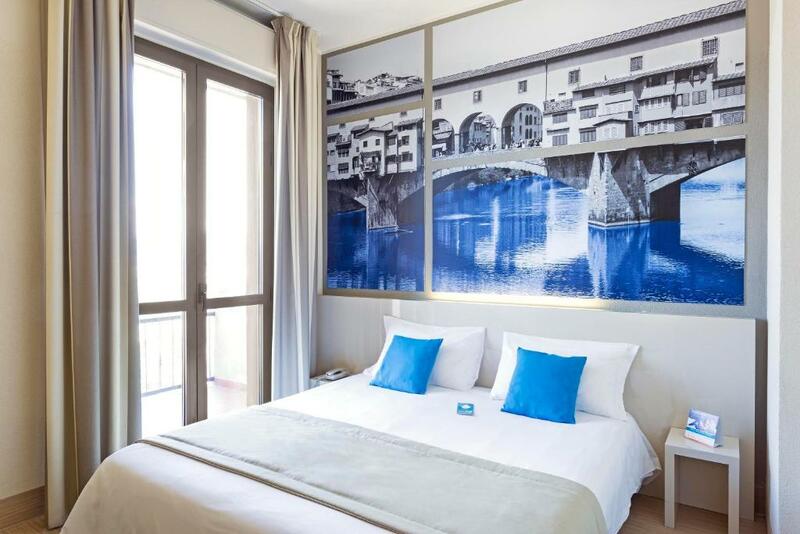 B&B Hotel Firenze Novoli accepts these cards and reserves the right to temporarily hold an amount prior to arrival. If you expect to arrive outside check-in hours, please inform the property in advance. You will be provided with a code to check in automatically. Price was good, but very utilitarian. Breakfast and hotel cleaning are good. Walls are very think, then you hear e everything from the neighbours. Beds not so comfortable. Nice place, clean, good location to use public transportation, tickets for the bus sold inside the hotel for just €1.5 each ticket for 90 minutes use. They have private parking without cost. I like everything about this hotel! The bus stop is literally next to the hotel and its only 1 bus ride to go to center!! Excellent internet. The room is very clean and nice. Exactly like the picture they display! Will definitely come back and stay in this exact same hotel again! Nothing really.. during our trip was a holiday and had caused a very terrible traffic and bus 22 ride going to this hotel. I guess and I hope its not like that during usual/normal days. Great breakfast buffet menu! Better to add this on the trip before heading outside for the tour. They only gave us one towel and the neighbourhood was not pleasant. Air conditioner in d room did not work. Had totally disturbed sleep the first night.After repeated requests to rectify the fate of the AC was d same the second night. Worked for few hours again switched off & made our stay miserable in the room. Secondly the refrigerator also did not work at all. No lift had to carry luggage upstairs and bring down . Location was good. Breakfast was satisfactory. All it was good, breakfast nice, it is a little far from center but is quiet and calm. It is a bus station near hotel , and you can take the bus directly to center. The reception offer us bus ticket Sunday in the morning 1,5 euro. Non-smoking policy not enforced. First assigned room reeked of cigarettes. Second room also stale. Smell of smoke came through the ventilation. Staff seemed indifferent. Avoid if you're not a smoker! Also, nearly scalded myself in the shower. Hot water way too hot! Not the hotel's fault but the bus can get pretty crowded at times. Nice cozy hotel close to a bus station and the north highway. Quite good and reasonably priced, especially over the weekend, breakfast. They have their own parking and you find parking places around in case it's full. You can buy bus tickets directly at the reception. Closing of the doors are a bit too noisy and you can hear them in the room. The staff was kind and helpful. We were able to buy bus tickets at the reception. It will be more comfortable to have minibar and electric kettle in the rooms. There was a strange smell when we first entered in the room but everything was clean and I think it was from air conditioner. Location was perfect cause is was near the bus station (2 min. walk) and you can easily go to the city center. Room was bright and clean. Friendly stuff.